Los Angeles-based label RAINMAN RECORDS is excited to announce the "British Live Performance Series," an eclectic mix of artists captured live in England. Recorded between 1979 and 1991, the series covers a wide array of artists and music styles including classic rock, pop and contemporary hitmakers. 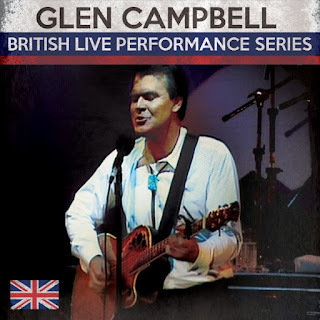 The first two CDs, out September 18, are powerful shows from the iconic country singer Glen Campbell and British prog-rock keyboardist Rick Wakeman. DVDs of most shows will become available as well. "We're excited to be bringing these U.K. shows to a U.S. audience," says Rainman Records president Ron Rainey, whose roster includes the entire Alvin Lee catalog, Kid Creole & The Coconuts, John Kay & Steppenwolf and Billy Dean, as well as management for the Marshall Tucker Band. "When I first heard these recordings, I knew immediately we had to release them. They deserve to be heard." The Glen Campbell show is the now-retired legend's first live album in 14 years, and was recorded in 1990 at the Dome in Doncaster, England. Backed by the Jeff Dayton Band, it features his biggest hits like "Rhinestone Cowboy" and "By The Time I Get To Phoenix." The inclusion of Paul McCartney's worldwide chart-topper "Mull Of Kintyre" allows Campbell to show off his instrumental prowess...on the bagpipes! In complete contrast, Jimmy Webb's "Highwayman" and Ralph McTell's "Streets Of London" are performed solo, with simple guitar backing. The last-named in particular is an understated standout and has become a big fan favorite. Rick Wakeman's 1990 show in Nottingham was recorded for a television series and reflects gems from throughout his storied career. Initially a successful studio keyboardist, Wakeman found international fame as a longtime member of YES, revered for his eclectic playing style. The lengthy compositions (with a three-person backing band) from this show explore the freedom his music allowed. "It was unbelievable," says Wakeman. "Something that will never ever happen again is freedom. Freedom to make the music you want to do, freedom to play as you wanted." Next up in Rainman Records' British Live Performance Series are sets from Uriah Heep, Belinda Carlisle and Joe Jackson.